Residents have been alerted after a fire broke out at a chemical factory in an industrial estate in Berkshire. Firefighters from three counties have been tackling the blaze at the site in Aldermaston since about 11:30 BST. The building is reported to house laboratory equipment and warnings have been issued for local residents to keep doors and windows shut. South Central Ambulance Service said the emergency services were currently "not clear exactly what is burning". 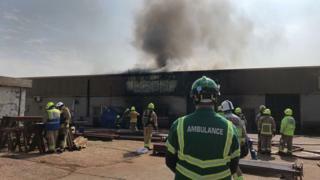 A total of seven crews from Berkshire along with crews from Hampshire and Oxfordshire have attended the fire at the industrial unit on Paices Hill. South Central Ambulance Service said they found no casualties during early investigations.